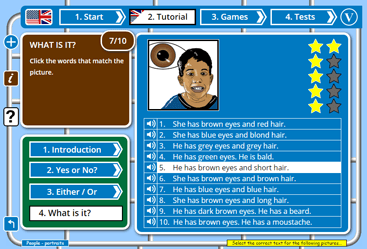 English Activities is a free website for children learning English as a second language (ESOL / ESL). It is full of lessons, games and tests to help children maximize their potential in English. All our lessons, games and activities are carefully designed to encourage and enthuse children learning English as a second language. English Activities is designed to fill in the gaps left by schools without the time or resources to get the children excited about learning a second language. English Activities makes what can be a difficult language simple, clear, and FUN. And if you are not, English Activities is still a fun and free bit of English revision for your child. English Activities makes English fun and simple. Your child will want to learn if they can enjoy their teaching. By using games and quizzes. The website is designed to be used either to learn English vocabulary and sentence structure, or to revise material already covered in class. The language is divided into topics, each with 10 pictures together with spoken and writtten language. Your child should start by choosing a topic based on their ability, age range or what they are studying at school. It is important that they start by doing the lesson for that topic. The lesson introduces the language and the pictures through simple clear activities that gradually reinforce the English. your child should be saying the English as much as possible while completing the lesson.